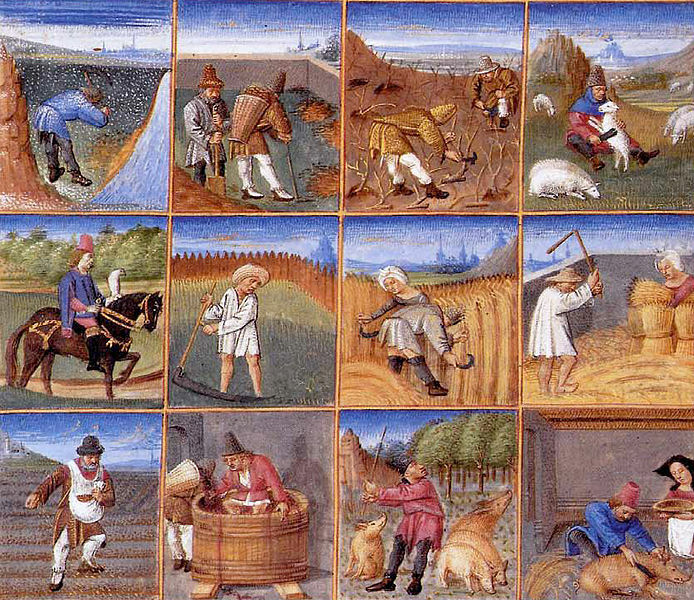 A year not in words but in agriculture from a calendar from a manuscript of Pietro Crescenzi, written c. 1306. The final assignment for the study of the novel Crispin and the Cross of Lead by Avi, our text while we studying the Middle Ages, is focused on character change but of course at it’s heart is word study. The text is set in England in 1377. It centres around a young boy, Crispin, who initially is only known as Asta’s son. He is falsely accused of a crime and declared a ‘wolf’s head’, a punishment that allows anyone to kill him on sight. Crispin changes through the course of the novel and through the friendship of Bear, a juggler and ex-priest, who has been strongly influenced by the real life character John Ball a priest who advocated social equality. Crispin finally discovers his identity and has, through his friendship with Bear, learned to question and think for himself. This novel serves our themes and recurring ideas of the year well: identity, belonging, oppression, standing up, courage, outsiders, exclusion , inclusion. Our last assignment based on the text considers character change. Students create an identity chart for Crispin as he appears in the beginning section of the novel then then towards the end. This involves discussing character change, motivation, turning points, foils. We encourage students to settle on five words from the group generated lists from above that best describe Crispin initially then the five most applicable to Crispin as he is at the end. Students are asked to support these choices with a line of text as well as providing a justification for each word choice. Of course in the determining of the most applicable word as a character trait, the students’ understanding of the word is deepened by considering the root, the morphemes and related words. We felt<nox +i+ous> seemed likely as the bound base in the word ‘noxious’. To prove that <nox> is a base we needed to confirm that the affixes could be peeled off and replaced by another. We know the connecting vowel <i> and <-ous> as in ‘famous’, ‘courageous’ but we could not find anything, at the moment of recording, in PDE with the base <nox> and different suffixes. .. so we reluctantly conclude the base is <noxious>….at least that’s where we left it until late last night when I dipped into the OE to discover ‘noxa’ and ‘noxal’. Noxa: Latin noxa harm, injury < the base of nocēre to hurt, injure (see nocent n. and adj.). 1971 Nature 2 July 18/2 Aspirin does not lessen pain in skin, elicited by noxious substances, but it does lessen pain in other sites, when elicited by similar noxae. 2001 Canad. Jrnl. Gastroenterol. 15 187 While a single liver tissue injury can be followed by an almost complete restitution ad integrum, the persistence of the original damaging noxa results in tissue damage. Etymology: < classical Latin noxālis (only in the jurists, usually in noxālis actiō , noxālis causa ) < noxa harm, injury (see noxa n.) + -ālis -al suffix1. Of or relating to damage or injury done by a person or animal belonging to or in the power of another. noxal action n. [after classical Latin noxālis actiō] the process whereby a claim is instituted against a party for such damage or injury. noxal surrender n. the compensatory surrender to the plaintiff of the person, animal, etc., by which the injury was done. These words would seem to indicate that there is a bound base <nox> from the Latin root nocere to harm. Listen below to Luciana and Sydney discuss their choice of words that they feel best applies to the character of Crispin at the beginning of the novel and then at the end. Others had done this over a week and these students who had been absent quickly wrapped up their understandings orally. They had had only twenty minutes or so to determine the morphemes and locate the roots. Of course word study is not a speed test but it was interesting for me to note how these students handled this. While their analysis of ‘insecure’ is faulty, it does show however the recognition of <–ure> as a suffix. There was sadly only one more day to talk about this ( and even for these keen word nerds it perhaps is not what they will be discussing on the last chaotic day of school!) If only there was more time ( my perpetual cry) we would be able to explore this word further. ‘Insecure ‘ as an adjective entered English in the 1640’s , about 140 years after ‘secure’. Secure with a sense of ‘without care’ , from Latin ‘cura’: care. ‘Secure’ as “without care” appears to be from two words ‘se cura’. So ‘insecure’ can be analyzed as <in+se+cure> with cure, sinecure, pedicure, manicure, procure as words related to the base element. Yes we had a list of words but that list was the essence of the year’s work. It was not there not to reinforce a spelling convention but to deepen understandings of the material students would read. What is encountered in these words is true for many words and what is crucial is for the students to be able to use these words, to think more deeply and this is only done with an investigation into the words to see the subtle nuances, the changes over time, to see the families and the relatives and know how the word has been battered around, changed, broadened or restricted over the years. Word study has bound us as a group. We have shared discoveries, students have discovered things I had not known and from the words we shared ideas, thoughts about life, beliefs about what we as humans need and want, how we treat each other, why we hurt one another, and why we stand-by. We finished the middle-ages unit discussing power and control, rebellion, betrayal and the slow march towards greater equality. Over the last few days we have watched the documentary Bully to cement understandings about power on a personal level to discuss difference, acceptance and integrity…( all words on our list). We have talked about how to reach deep inside to be true. Spelling and word study is more than letters in the correct order, more than a quick glance in the dictionary to parrot the meaning. This has been a year deeply enmeshed in words and we have only had a mere glimpse at the power it can bring to our thinking. What I know after this year is that we have connected as a group and we have explored all this by, because of, with, in and through words. Below The Year in Words ( or at least some of them) created by several students who would come in before school to play around on the whiteboard with words. Thankyou in particular to Nina and Oluwadara. And that’s it from the Word Nerds of 2012/2013 of a year in words.